At the Vermont Quilt Festival last summer, I met a quilter who shared with me how she works on quilts. It was affirming and reassuring to know that I am not the only person who likes to work on multiple projects at a time. She is always thinking of new creations and brings them to fruition by working on many in different stages of completion. 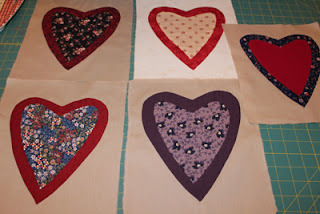 This way she is always planning something fresh and new, cutting it out, sewing patchwork or appliquing their tops and then quilting them, after sandwiching the top and backing with batting in the middle. It is certainly a boredom buster, and way to avoid the tediousness of pushing ahead on one project at a time. 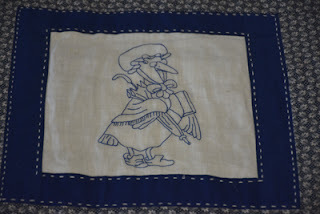 She also related that some quilts are NOT to be finished as with some, she has learned all that she wants to learn, and spending time finishing them will not be worthy of her time! 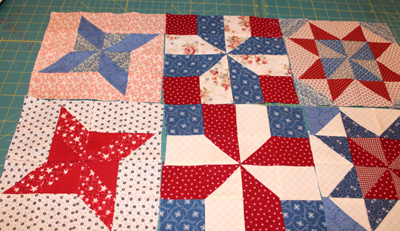 I am only into the third week of the new year and I see my quilt blocks growing. I have contracted with myself to do two blocks each week on my Civil War quilts, and two more appliqued heart blocks and a pair of strips for the nine patch quilt which usually works out to create about ten blocks when each pair of strips is cut and re-sewn together. 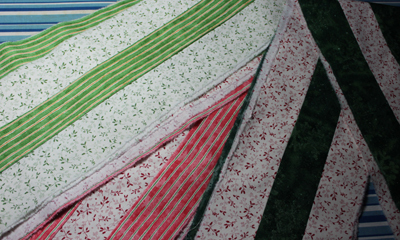 Pairs of strips sewn together to create nine patch blocks. I have pulled out my mother's beautiful hand-made candle-wicking quilt that she left for me to complete. I have not unpacked it all yet, but look forward to studying her process and access what is completed and what is left to do before proceeding. I am under no illusion that completing this quilt will be quick. 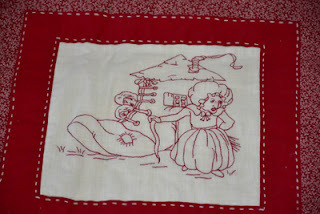 It is all hand-stitched and hand-quilted and will take a lot of time to complete it using these same techniques. I learned a long time ago that the hardest step in any project is to "start it" and I am about to do just that. Once I have studied it, it will simply be a case of taking each step in a methodical step-by-step approach and with persistence and perseverance, I can and will complete it! beautiful of my mother's quilts. exquisite! She quilted it using a quilt-as-you-go technique. It is one of the most beautiful quilts I have ever seen! piece of art and will take much help from her to finish this! 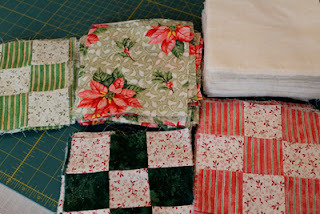 I have practiced various methods of quilt-as-you-go techniques and feel as prepared as I am going to be to form a plan as to how to tackle it. My mother's work is so beautiful that I have been afraid to touch it. I will step right into the middle of her process. I feel sad that she is no longer here to consult. I clearly should have taken notes years ago when I first committed to finishing it for her. 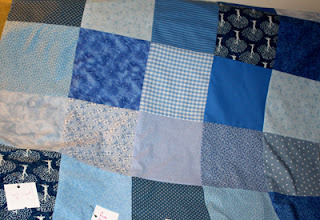 I will pray that she will support me from the other side and help guide me through finishing her most beautiful quilt. I figured that this is the most important work I have to complete. She might well be onry enough that she might lock heaven's gates and not let me in until it is finished, for that is the promise I made to her when she was struggling to finish it. I am inspired to complete all my UFO (unfinished objects) quilts I have started, though not all this year. Don't ask how many! I feel more confident than I did a few years ago after practicing and finishing three quilts in the past couple of years. 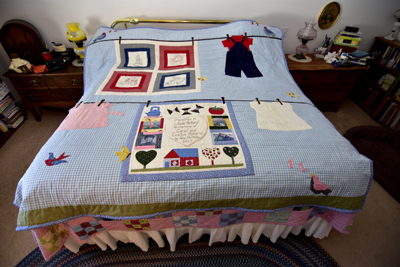 My last was a nine patch/nine patch reversible memory quilt for a friend that was inspired by receiving a box of fabrics, vintage hand-embroidered quilt blocks and hand-made infant clothing that had belonged to my friend's mother. 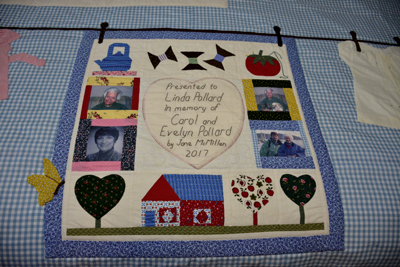 My friend lost both her sister and her mother in a very short period of time, along with her two little lap dogs, so all were remembered in this quilt's dedication on the backside. to her mother. It is both machine quilted and hand tied. 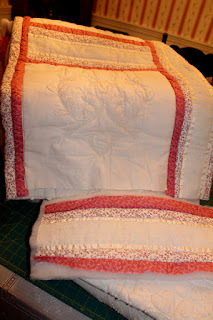 There were enough 9 patch blocks to create a second quilt that I put together with mauve colored fabric making it's appearance look totally different. 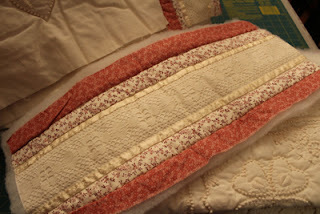 I quilted them using different styles of machine quilting. The memory quilt is both tied as well as machine quilted leaving me less seams on the back-side of the quilt, which became my clear checkered blue sky "canvas" for the appliqued memorial to her mother and sister. It arrived in time for Christmas and before the end of 2017 (in the nick of time, to not have to redo the date on the quilt). sky "canvas" for this hand-appliqued clothes-line scene. This dedication mini-quilt hangs on the bottom clothes-line. 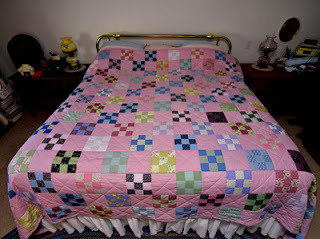 couldn't make this quilt appear too sweet! sewn by my friend's mother. blocks but never as sweet as these! 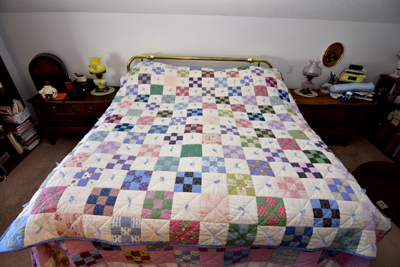 When my husband photo'd these quilts, he assured me that the clutter on our dressers would be easily photo-shopped out of the pictures, but cropping them was not so easy, and so, as with everything else in my life, it is a case of learn the hard way what-to-do and not-to-do when photographing my quilts. So the pictures of my friend's memory quilt front and backside, and its sister quilt are complete with our home-made clutter on our dressers. It should comfort those of you that are like me who have to focus on either quilting or cleaning and never at the same time! of by gone years with my silly friend, Linda Pollard! I take my life one day at a time and each is filled with quilting, which is my version of a perfect retirement. 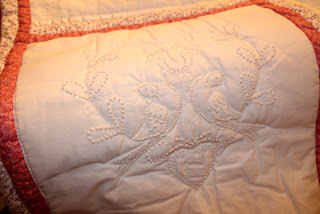 My quilts are lessons of love and patience. I will complete and start many more in my, God-willing, many remaining years! New Years--How Cold It Is, but Warm Inside!